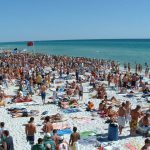 Collegiate Marketing Group LLC, reports that Spring Break 2011 in Panama City Beach is already shaping up to be one of the largest ever. College students heading to this Gulf of Mexico resort town should be prepared to book their accommodations early as local hotels are reporting that reservations are up 15-20% over last. Many local hotels are attributing the recent surge in reservations to tragedies and safety concerns circling destinations in Mexico. Over the past few years Spring Break numbers have been dwindling in Mexico due to concerns with tourist safety and health related issues from H1N1. Other contributing elements to the current flood of PCB hotel reservations may have to do with an aggressive internet marketing campaign launched by a local co-op of Panama City Beach businesses mostly comprised of hoteliers and nightclubs. A survey done by Collegiate Marketing Group say’s this media blitz plays a major part in keeping this Florida destination in front of students when it came time for them to make their Spring Break travel plans. A key element to the success of this Spring Break marketing plan, was to use popular social networking sites like Facebook and Twitter to reach millions of students at targeted universities and colleges nationwide. Panama City Beach, Florida is considered to be the most affordable and most popular Spring Break destination in the world and normally sees upwards of 500,000 students descending on the beaches every March. Students that choose this destination normally want the Spring Break experience without spending a bundle on transportation and accommodations which usually are attached to international destinations. So if college students are looking to save a few dollars this Spring Break, they should consider this incredibly popular Spring Break destination. Every year at least a quarter million students head to this U.S. hotspot for some cheap fun in the sun. Well known as the “beach within reach” this area is the undisputed “Spring Break Capitol of the World”.